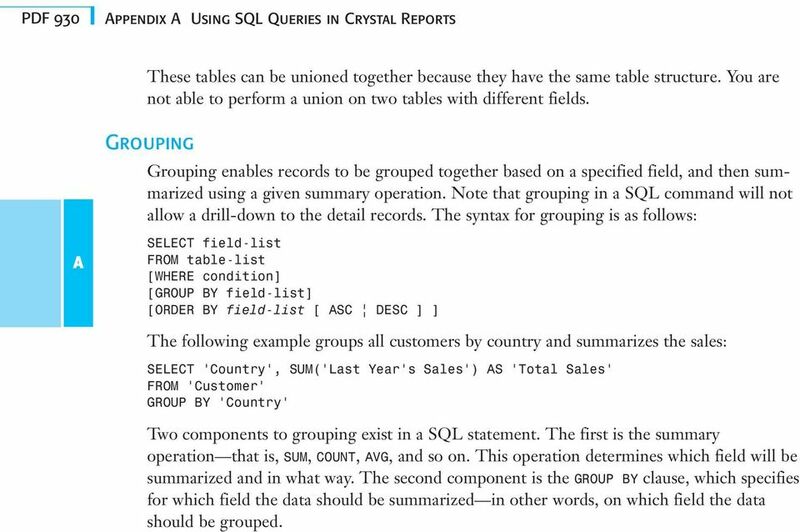 Download "Using SQL Queries in Crystal Reports"
2 PDF 924 ppendix Using SQL Queries in Crystal Reports The SQL Commands feature was introduced in Chapter 1, Creating and Designing Basic Reports. 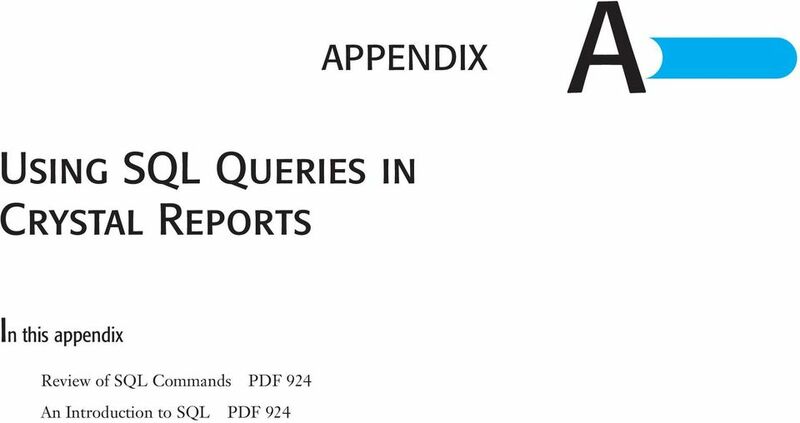 For those users who are unfamiliar with SQL (Structured Query Language), this appendix serves as an introduction and helps enable the creation of SQL commands. For those users who are familiar with SQL, this appendix serves as a refresher with some important tips pertaining to the use of SQL with the new SQL Commands feature. 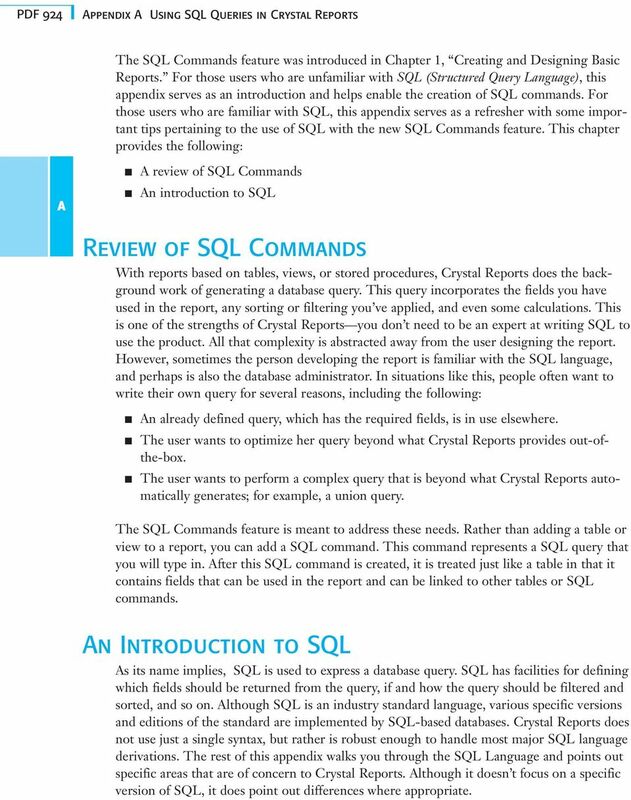 This chapter provides the following: review of SQL Commands n introduction to SQL Review of SQL Commands With reports based on tables, views, or stored procedures, Crystal Reports does the background work of generating a database query. This query incorporates the fields you have used in the report, any sorting or filtering you ve applied, and even some calculations. This is one of the strengths of Crystal Reports you don t need to be an expert at writing SQL to use the product. ll that complexity is abstracted away from the user designing the report. However, sometimes the person developing the report is familiar with the SQL language, and perhaps is also the database administrator. In situations like this, people often want to write their own query for several reasons, including the following: n already defined query, which has the required fields, is in use elsewhere. The user wants to optimize her query beyond what Crystal Reports provides out-ofthe-box. 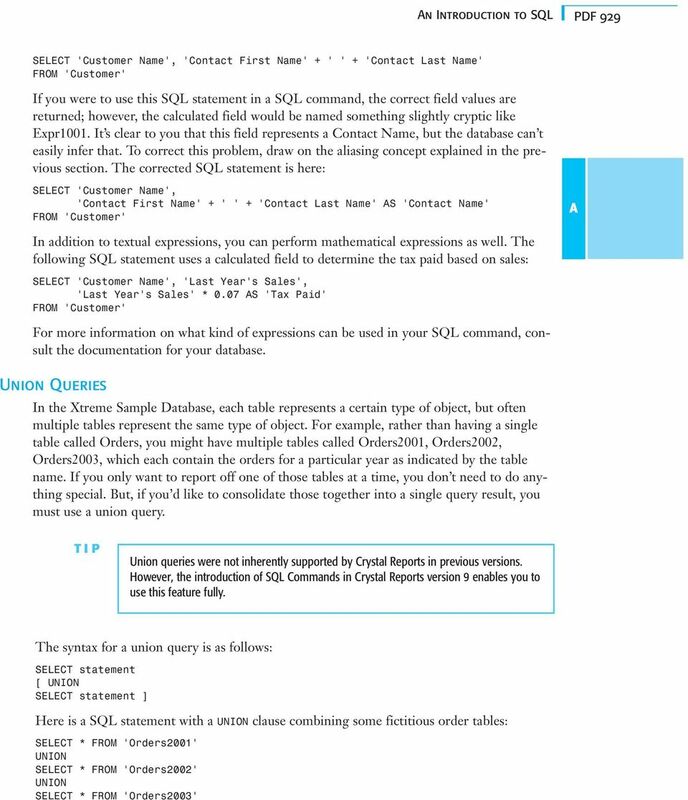 The user wants to perform a complex query that is beyond what Crystal Reports automatically generates; for example, a union query. The SQL Commands feature is meant to address these needs. Rather than adding a table or view to a report, you can add a SQL command. This command represents a SQL query that you will type in. fter this SQL command is created, it is treated just like a table in that it contains fields that can be used in the report and can be linked to other tables or SQL commands. 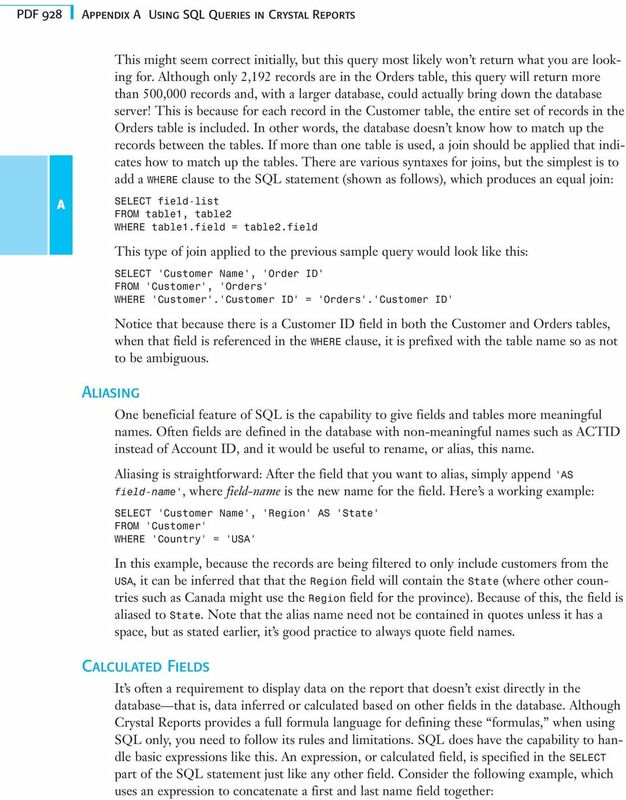 n Introduction to SQL s its name implies, SQL is used to express a database query. SQL has facilities for defining which fields should be returned from the query, if and how the query should be filtered and sorted, and so on. lthough SQL is an industry standard language, various specific versions and editions of the standard are implemented by SQL-based databases. Crystal Reports does not use just a single syntax, but rather is robust enough to handle most major SQL language derivations. The rest of this appendix walks you through the SQL Language and points out specific areas that are of concern to Crystal Reports. lthough it doesn t focus on a specific version of SQL, it does point out differences where appropriate. 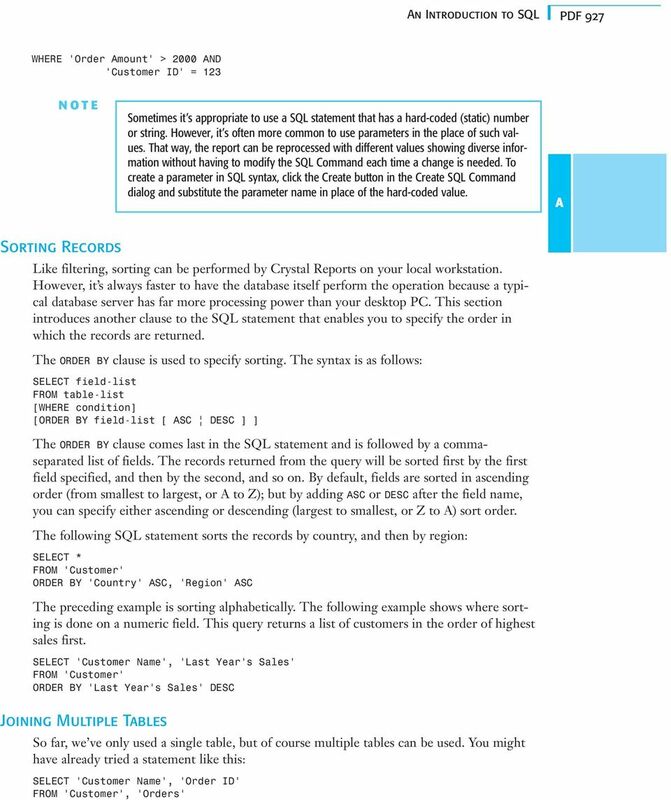 3 n Introduction to SQL PDF 925 The SELECT Statement Even though the name implies that SQL is only about querying databases, most implementations also enable you to insert, delete, and update records inside the database. Each of these distinct actions has its own command: SELECT (query), INSERT, UPDTE, and DELETE. lthough SQL commands allow any valid SQL statement that returns records to be used, SELECT statements are generally the only statements to be used. However, there are situations in which other statements can be used in addition to a SELECT statement. One example of this is running an INSERT statement to create a record to log the fact that the report is being run. 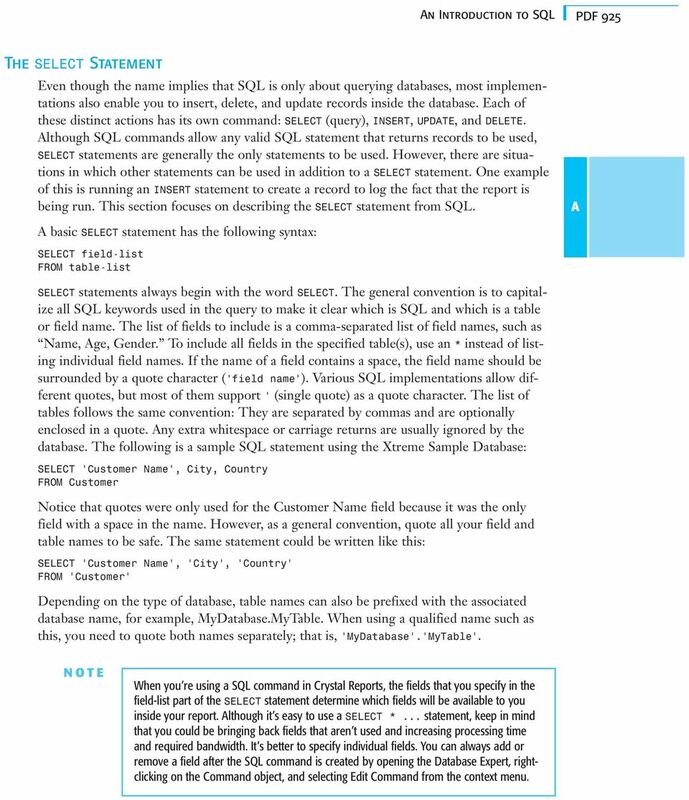 This section focuses on describing the SELECT statement from SQL. basic SELECT statement has the following syntax: FROM table-list SELECT statements always begin with the word SELECT. The general convention is to capitalize all SQL keywords used in the query to make it clear which is SQL and which is a table or field name. The list of fields to include is a comma-separated list of field names, such as Name, ge, Gender. To include all fields in the specified table(s), use an * instead of listing individual field names. If the name of a field contains a space, the field name should be surrounded by a quote character ( field name ). Various SQL implementations allow different quotes, but most of them support (single quote) as a quote character. The list of tables follows the same convention: They are separated by commas and are optionally enclosed in a quote. ny extra whitespace or carriage returns are usually ignored by the database. The following is a sample SQL statement using the Xtreme Sample Database: SELECT 'Customer Name', City, Country FROM Customer Notice that quotes were only used for the Customer Name field because it was the only field with a space in the name. However, as a general convention, quote all your field and table names to be safe. The same statement could be written like this: SELECT Customer Name, City, Country Depending on the type of database, table names can also be prefixed with the associated database name, for example, MyDatabase.MyTable. When using a qualified name such as this, you need to quote both names separately; that is, MyDatabase. MyTable. NOTE When you re using a SQL command in Crystal Reports, the fields that you specify in the field-list part of the SELECT statement determine which fields will be available to you inside your report. lthough it s easy to use a SELECT *... statement, keep in mind that you could be bringing back fields that aren t used and increasing processing time and required bandwidth. It s better to specify individual fields. You can always add or remove a field after the SQL command is created by opening the Database Expert, rightclicking on the Command object, and selecting Edit Command from the context menu. 8 PDF 930 ppendix Using SQL Queries in Crystal Reports These tables can be unioned together because they have the same table structure. You are not able to perform a union on two tables with different fields. Grouping Grouping enables records to be grouped together based on a specified field, and then summarized using a given summary operation. Note that grouping in a SQL command will not allow a drill-down to the detail records. The syntax for grouping is as follows: FROM table-list [WHERE condition] [GROUP BY field-list] [ORDER BY field-list [ SC DESC ] ] The following example groups all customers by country and summarizes the sales: SELECT Country, SUM( Last Year s Sales ) S Total Sales GROUP BY Country Two components to grouping exist in a SQL statement. The first is the summary operation that is, SUM, COUNT, VG, and so on. This operation determines which field will be summarized and in what way. The second component is the GROUP BY clause, which specifies for which field the data should be summarized in other words, on which field the data should be grouped. Retrieving Data Using the SQL SELECT Statement. Copyright 2006, Oracle. All rights reserved. 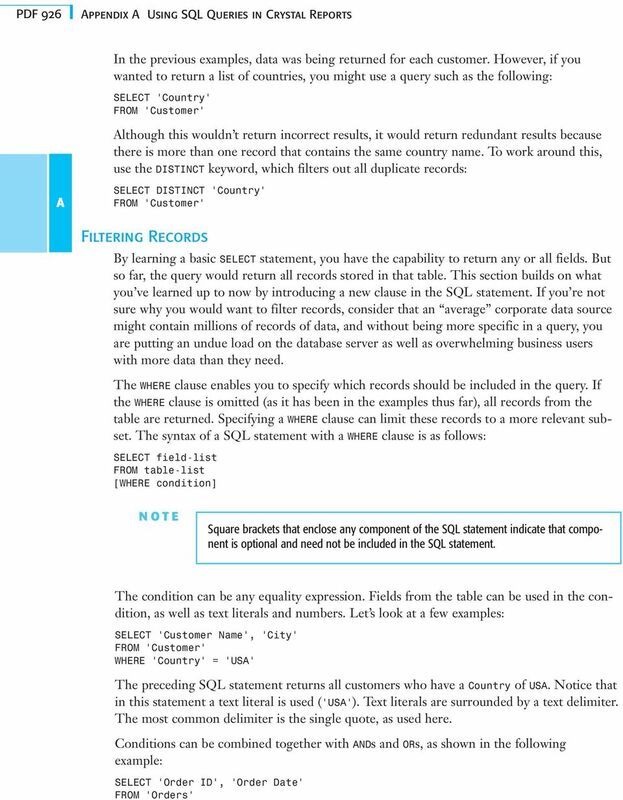 Create a Report Definition of Type Database Query. To create a report definition using a database query, follow the steps below. Welcome to the topic on queries in SAP Business One. for Developers This is a training guide to step you through the advanced functions of in NUFinancials. is an ad-hoc reporting tool that allows you to retrieve data that is stored in the NUFinancials application. Sample- for evaluation purposes only. Advanced Crystal Reports. TeachUcomp, Inc.
A Presentation of TeachUcomp Incorporated. Copyright TeachUcomp, Inc. 2011 Advanced Crystal Reports TeachUcomp, Inc. it s all about you Copyright: Copyright 2011 by TeachUcomp, Inc. All rights reserved. MarkLogic Server. Query Console User Guide. MarkLogic 8 February, 2015. Copyright 2015 MarkLogic Corporation. All rights reserved. SnapLogic Tutorials Document Release: October 2013 SnapLogic, Inc. 2 West 5th Ave, Fourth Floor San Mateo, California 94402 U.S.A. www.snaplogic. PSU 2012 SQL: Introduction SQL: Introduction The PowerSchool database contains data that you access through a web page interface. The interface is easy to use, but sometimes you need more flexibility. Resources You can find more resources for Sync & Save at our support site: http://www.doforms.com/support.